About a week ago, we were out walking and I saw this beautiful light and wanted to capture Elizabeth in it. At the time though she complained that she wasn’t pretty enough and didn’t have a nice smile. I let it go but her comments stayed with me, and pulled at my heart. 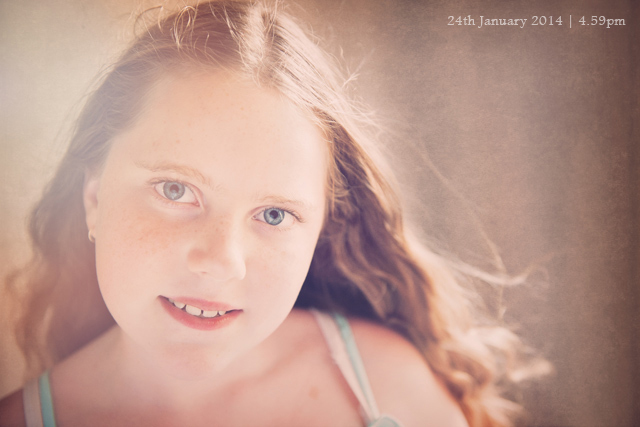 This afternoon I wanted to practice a few things and asked Elizabeth to be my model and spend time with Mum. We had lots of fun, trying different poses and setups. This is what we came up with. Tonight Elizabeth sat with me while I finished creating the vision in my head…. A stunning image of my darling girl as she moves towards becoming a teenager. She is beautiful, both on the inside and out. I asked her what she thought and she loves it, and now agrees with me that she does have a nice smile, and she is pretty enough. My job is done. To me be able to use my gift to capture these moments in time of my daughter, to be able to create gorgeous pieces of art for us to all enjoy for years to come, brings me such joy and it is why I do what I do. Oh my goodness what a beauitful photo, words cant express how lovely this photo is….